The following article was published in the 3 February 2019 edition of The Sunday Mail, written by Michael Madigan (Regional Reporter). Farmers crying out for help have tapped an unexpected, and reliable, well of new employees – older workers. 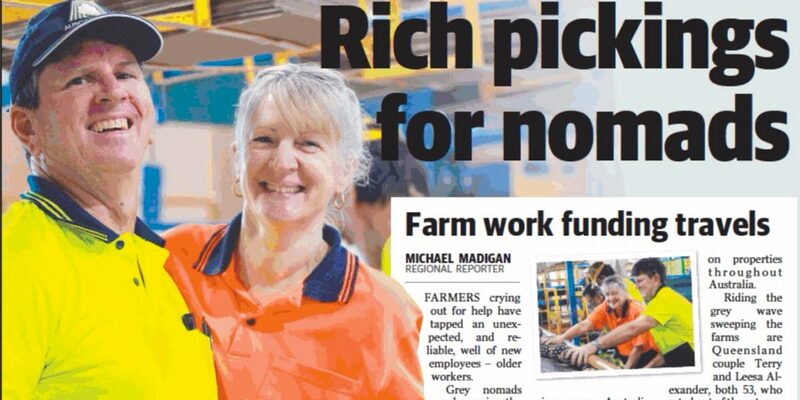 Grey nomads are becoming the new backpackers for Queensland farmers, proving to be steadfast, committed and valued workers. One major recruiter says the grey-backers comprise up to 10 per cent of the workers on their books. With the National Farms Federation claiming up to 100,000 farm jobs are going begging across Australia, and discussions about a new class of agricultural visa on the backburner, they are filling an important gap. Casey Brown, managing director of Agri Labour Australia, says there is enormous potential for older workers to move beyond 10 per cent of their workforce, with numbers set to increase as word spreads of the many opportunities available on properties throughout Australia. Riding the grey wave sweeping the farms are Queensland couple Terry and Leesa Alexander, both 53, who opted out of the rat race in 2008, choosing to sell their house at Hervey Bay and hit the road in car and caravan. The Alexanders travel for five months of the year and spend seven months, picking pineapples, mangoes, cotton – wherever unskilled labour is needed. “We don’t think or talk about retirement – this is retirements and we love it,” Mrs Alexander said. Terry and Leesa Alexander were two pioneers of Agri Labour Australia’s Grey Nomad worker stream. If you’re considering following in Terry and Leesa’s footsteps, or if you’re interested in accessing hard working grey nomads for your agricultural projects, get in touch with the Agri Labour Australia team at [email protected] or 1300 247 823.